Looking for a way to up your beverage game? 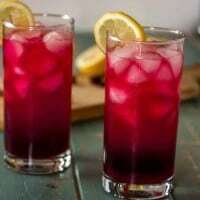 You’ve got to try hibiscus tea (AKA agua de jamaica)! Today we have a twofer: A Ginger Hibiscus Martini and a Mocktail. 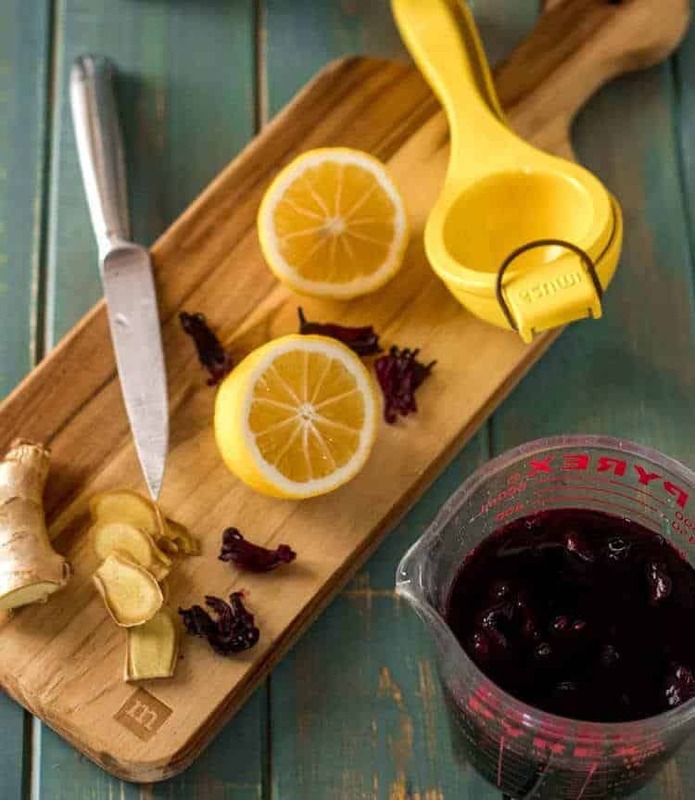 They start with the same base – strong hibiscus tea and fresh squeezed lemon juice. The martini gets finished with muddled fresh ginger, gin, and dry vermouth, while the mocktail is topped off with non-alcoholic ginger beer. I have a sneaking suspicion this one may become a summer favorite! I must confess. My motivation in coming up with a suitable non-alcoholic substitute for the Ginger Hibiscus Martini (martini’s are my favorite!) is in part selfish. I love cocktails, but I also love being healthy and watching my weight. At 58, this has become more of a challenge. I drink still and sparkling water, but let’s face it, they’re just not that exciting. I swore off sodas years ago, and even an afternoon iced tea has begun to give me trouble (caffeine issues). My favorite bartender (and husband Mark 😉 ) and I decided the solution might lie in creating equally interesting “mocktails.” The Ginger Hibiscus Mocktail is exactly the kind of beverage we were after! What do you know of hibiscus (sorrel, jamaica) other than its gorgeous hue? The anthocyanin (purple and red hued antioxidants) present in hibiscus tea means it is loaded with health benefits, including anti-inflammatory properties, improved organ health, possible decreased risk of cancer, among others. The hibiscus tea is made with the dried calyces (protection for the flower bud of angiosperms), not the actual flower petals. The tart flavor of hibiscus is similar to cranberry juice. It is naturally caffeine-free, and a great alternative to iced black tea to quench your thirst. 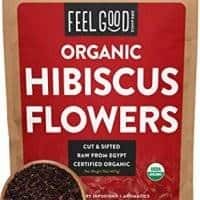 You can make a hot cup of hibiscus tea in just a few minutes, and a properly brewed tea for other uses requires only about 15-20 minutes (to cool completely). Enjoy it year ’round, but I find the gorgeous hue particularly pleasing in spring and summer! You will start both drinks with a strong and slightly sweetened hibiscus tea. Bring 3/4 cup of water to a boil, remove from the heat, add the dried hibiscus, and allow to cool completely. Strain through a fine mesh sieve or coffee filter, pressing on the solids to extract all the liquid. Sweeten to taste. I suggest 1 tablespoon of agave nectar. I like it somewhat tart, but you may prefer it sweeter. Store leftover tea in an airtight jar for another use. I’m working on Gluten Free Tarts with Vanilla Pudding, Berries, and a Hibiscus Glaze, and that’s a great way to use the remaining hibiscus tea… I’ve also included some additional possibilities at the end of the post! While the tea cools, assemble the other ingredients. For the martini, you’ll need several thin slices of fresh ginger. Both beverages get fresh squeezed lemon juice. Use Meyer lemon if you can get one. Once the tea is cool, your drink is only a shake, pour, and stir away! For the Ginger Hibiscus Martini, muddle the ginger with the lemon juice and the hibiscus tea, then add gin and vermouth. Shake and strain into a martini glass. The Ginger Hibiscus Mocktail includes the ginger slices muddled with the lemon juice, and the hibiscus tea. 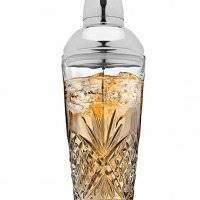 It gets shaken and strained into a highball glass with ice, and topped off with non-alcoholic ginger beer. Voilà! 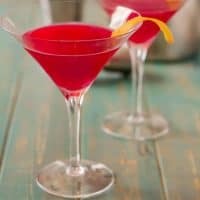 Fresh flavors and the brilliant magenta hue make this martini variation a perfect warm weather sipper! Bring water to a boil. Remove from the heat source. Add the hibiscus. Allow to steep until cool. Sweeten with agave nectar. (See notes). Muddle the sliced ginger with the hibiscus tea and fresh lemon juice (in a cocktail shaker. Add ice, the gin, and the vermouth. Strain into martini glasses. Add a lemon twist. We often prefer to sweeten with agave nectar rather than taking the time to make a simple syrup. Substitute your preferred sweetener to taste. My tea recipe is still fairly tart. 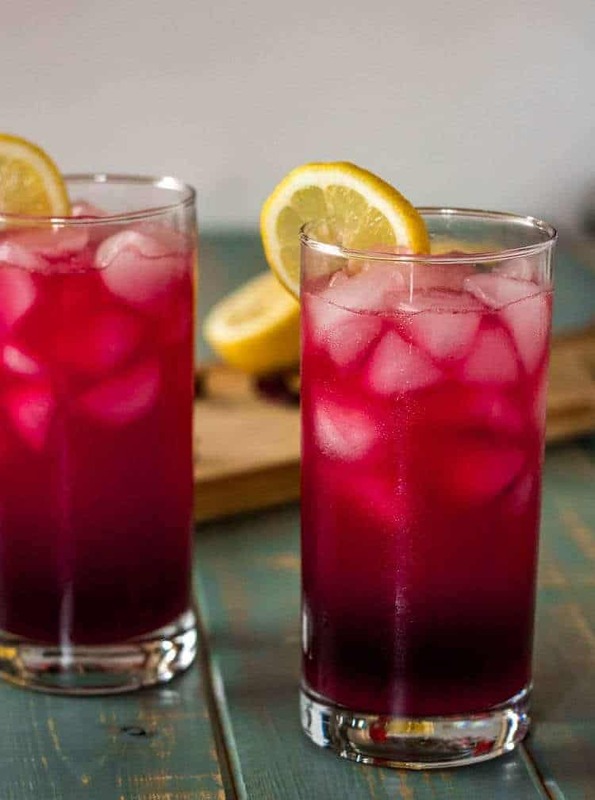 Combine hibiscus tea and lemon juice in a shaker with ice. Shake vigorously. 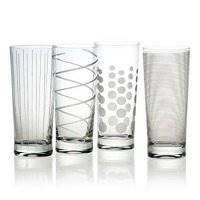 Strain into highball glasses filled with ice. Top off with ginger beer. (See notes). Give it a good stir to combine. Garnish with a lemon wheel as desired. 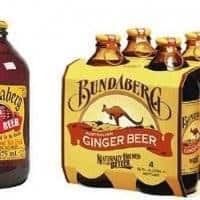 My husband and I LOVE Bundaberg Ginger Beer. 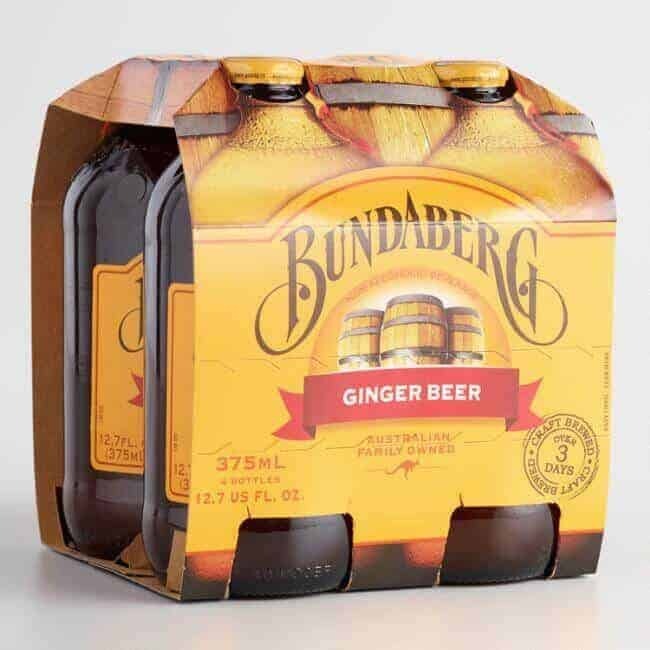 As I mentioned in the post, we're trying to watch the amount of alcohol and calories we consume, and their Diet Ginger Beer has only 25 calories per bottle. We split 1 bottle between the two highball glasses, making this a really calorie-conscious choice! I would drink both versions right on up! They are so perfect for this Houston summer heat. Can't wait to try them on my friends and family. Wow, this is one of my favorite mocktails, we drink it all year long and I grow the hibiscus. I can't wait to try it with ginger beer, such a great idea. Really? We tried to grow hibiscus in our garden, but I guess it wasn't getting enough sunlight. We had to pull them both out. :-( The tart, floral flavor of the hibiscus works really well with ginger beer! This drink sounds so delicious and refreshing. Love how you included the recipe for the mocktail as well! When I was playing with the hibiscus, I tried both a martini and a mocktail. We loved them both, and I thought about separating them, but the post is more about using hibiscus as a flavoring, so I hope it works! I love the creativity!! Such a pretty drink, too!! Perfect for summer! Looks like your hubby came up with a great recipe here!! He's a pretty handy guy to keep around... ;-) Thanks Amanda! I looooove hibiscus for so many reasons, and this cocktail is another one! It's so refreshing and delicious, and the color is absolutely stunning. Thanks for offering an alcoholic and non-alcoholic version! I can't wait to make the martini, personally! Thanks Sara! 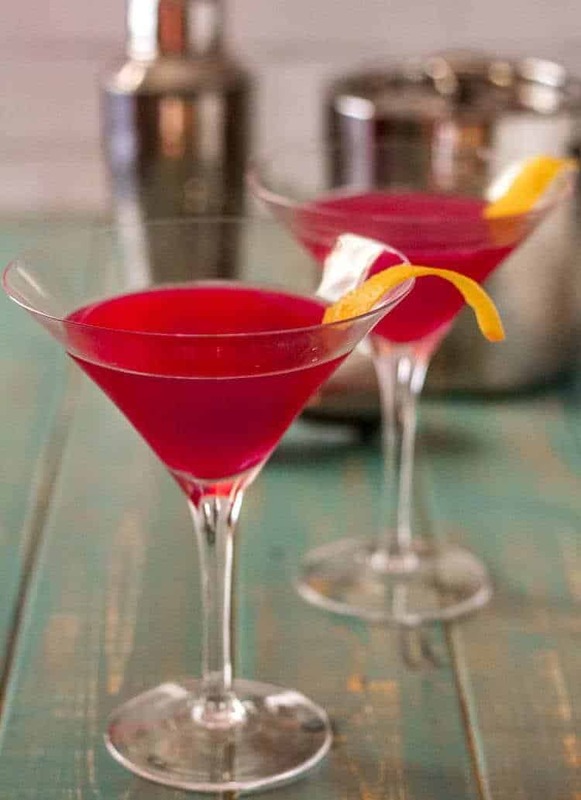 I love them both, but I do enjoy "cocktail hour," and the hibiscus martini makes a regular appearance! Well, I hear you when it comes to caffeine, enjoying your adult beverage, and trying to keep that old weight off. I do like hibiscus tea -- I always have and the color is so pretty. I'll be going to my favorite tea shop -- I'll have to get some and make your mocktail. Thank you for this 2 in one drink. I love both the ginger and the hibiscus tea in this. Looks great! Yum! Love me a great mocktail! I love the fresh ingredients you are using in this refreshing looking drink! Thanks Paige! It's a great hot-weather sipper! Such a gorgeous color, and great flavor combo! Thanks for sharing your recipe. It's all about that gorgeous hue, right? What a delightful drink! I know that I would love it. All of these flavors are so good! And it's so perfect for the summer! Thanks Kate! It is indeed perfect on a hot summer day (or spring in south Texas)! This sounds like a great summertime drink. Perfect for the BBQ parties and the warm weather. The colour is great....and the fact you can make it two ways....great for everyone to enjoy. I love the color too! And it's refreshing with or without alcohol... Yes, perfect for summer parties! No mocktails for me! I love the thought of gin, ginger and hibiscus together!! 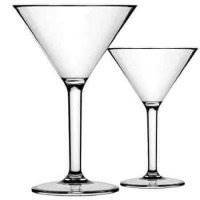 These martini's look delicious. Okay, I may even be persuaded to try the mocktail version! That's how good these look! This recipe is full on refreshing deliciousness. Can't wait to get my hand on some more hibiscus tea. Wishing you a super weekend!